Ansals Buildwell Ltd., a pioneering stalwart in the real estate sector in India, proudly presents Garden View Apartments facing Ansals Riverdale Children's Park. A place where tranquility and sophistication mix. Where you are close to the city and its amenities. Its a home where design spells out a great lifestyle. 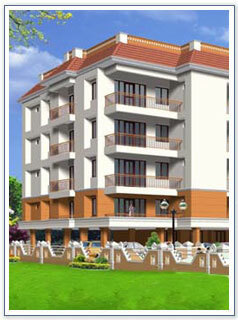 Garden View Apartments is located at Eroor, a short drive from the NH Bye Pass. A home which offers everything a family needs, a great environment, salubrious surroundings and recreational facilities. Added to this, the exceptional quality, finish and value provided by Ansals who has over the years built more than a million square meters of residential, commercial and industrial complexes housing, serving over one lakh people. The meticulous choice of location, stringent quality control, state-of-the-art amenities, timely completion and excellent after sales services make Ansals the most trusted builders. Ansals Riverdale's stunning design, location and cutting edge features has set into place a novel concept of Town Houses in one of the rarest projects in Kochi. Riverdale is an elite residential project with independent luxury villas, 10-meter wide tree lined avenues, jogging track, water and sewage treatment plants. The 10-Acre township has large open space accommodating Children's park and beautifully laid lawns all along the river frontage of around 500 meters and convenience for boating. A home you will love for the excitement, comfort and luxury it provides. The apartments are sleekly styled to fit into the hectic lifestyle of the entrepreneurs, businessmen, professionals and executives apart from homemakers and children. enjoy magnificent views of the calm backwaters, stroll in the well-landscaped environs at Ansals Riverdale. Riverdale Recreation Centre is meticulously designed considering requirements of your entire family - with some of the best facilities available in Cochin. The swimming pool, well-equipped Gym, card room, badminton court, tennis court, restaurant and party space for entertainment - all provide for an enchanting experience. It's the perfect place to spend your evenings entertaining your business associates, friends and relatives or spending some quality time with your family.